There is a unique charm about a crisp brown paper parcel arriving in the mail. Like an exotic unannounced traveller at your doorstep, a parcel is mysterious and exciting, prompting questions of origin and purpose. I’ve always had a quiet fascination with snail mail. The romance of an envelope or twine-wrapped bundle journeying across oceans and continents is almost as sickly sweet as a wartime love story. The mechanism of mail also intrigues me. I imagine packages and letters of all shapes and colours piled in warehouses across the world, patiently waiting to be sorted and dispatched to unsuspecting addressees. I hold similar affection for wandering books; those paperbacks from hostels with multi-lingual inscriptions by past travellers. Oh it’s almost enough to make me break into a song about a sharing, caring world. So when I was browsing the book store with Dave the other day and he suggested we post books to some friends, I must admit, I did skip and squeak right there on the spot. From there, the idea evolved into what is now ‘the 5 book project’. Mail five books to five people across the world. Each book has been chosen with care and mailed with the hope it will bring a little bit of unexpected joy. 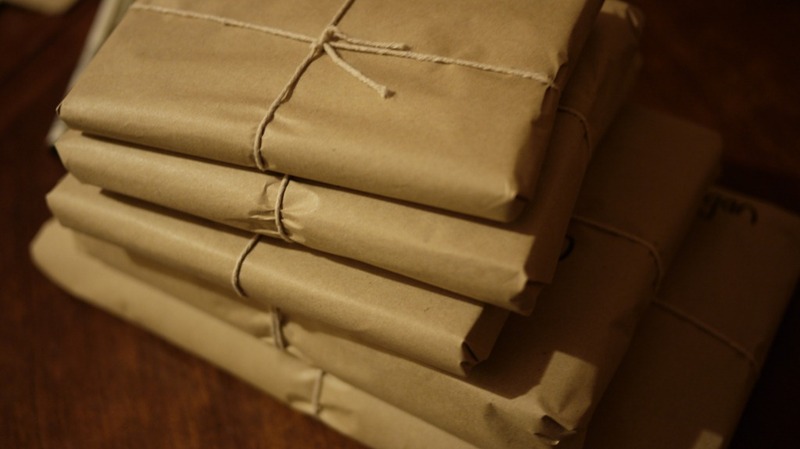 If you receive a random book in a brown paper parcel, please write me a comment…or a letter… and share some of that mail-receiving joy. I’d love to hear about your book and your patch of the world. I flew back from Madrid late on Tuesday night, having enjoyed 4 glorious days of sunshine in a laid-back, welcoming city. It reminded me a lot of Brisbane, and made think forward to next year when I’ll live there again. The journey back home was protracted and the waves of homesickness that hit every time I pass through the outer suburbs of London were amplified by my tiredness. So when I found your parcel under a pile of utility notices, well after midnight, I skipped and squeaked too. And upon cutting through the twine and brown paper and reading the message on the cover page, I burst into tears. Nicole and Dave, thank you so much for your thoughtfulness. Four more weeks until we can catch up under a Jacaranda tree! In the meantime, I’ve got some reading to do. Yay Kurthy! I am so pleased we gave you a happy surprise and a little bit of love from home. Thank you so much for writing to us to tell us out it! Your glee has made my day and your reaction is pretty much what we hoped for when sending those little bundles around the world. Parcels often remind me of home too, and although you are much further from your family and friends than I am, I hope the book will make you think of all the people back in Brisbane who miss you. Looking forward to catching up with a cuppa under that Jacaranda and hearing all about your adventures in Madrid and about the rest of Europe! P.S. Dave passionately believes that is the book for you (note it’s also one of his favourites).